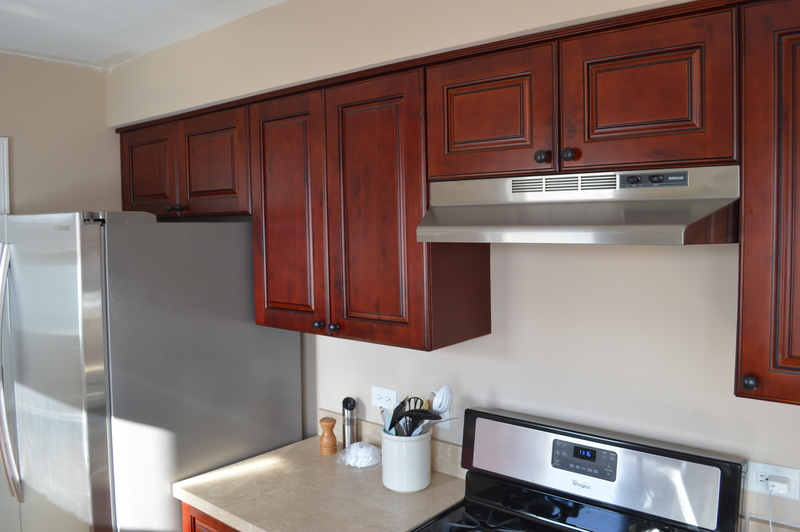 Finally…our galley kitchen remodel reveal! The day is here! After a ton of projects, a lot of hard work and a few disagreements, I can finally say that the kitchen remodel is done! It took a lot longer than either one of us thought it would but it’s totally done and I can’t wait to finally give you the tour. We started the remodel on our small galley kitchen in January 2015 with a plan to lighten up the space and create more storage. Here it is before we moved in, red cabinets and all. And the after. Such a huge difference, don’t you think? 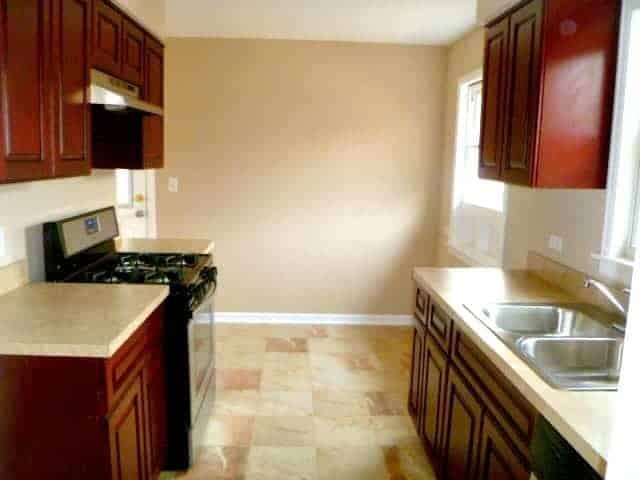 The 2 things that didn’t change in the kitchen were the appliances and the tile floor. Before we installed the cabinet that we built. We love all of the prep space that we have now and the hubs uses every inch. This is how it looks every day, not styled and ready to use. This house was built in 1956 and had enough space for a small refrigerator from that era. To give it more of a custom look, we built a cabinet around it to help disguise it. There’s no denying though, that it is huge. I won’t subject you to any more bad “before” pictures. The end cabinet, where I store all of our dry goods, was our final project. It’s the first time I’ve been able to store all of my food in one place. It truly feels like a luxury. It still feels strange to walk into such a bright space. Even though we didn’t add any square footage, and added a cabinet on an empty wall, it actually feels bigger. It’s the first white kitchen that I’ve ever had and I love it. I think it was the right thing to do in this small space. If you have any questions about the kitchen, feel free to comment or email me and I’d be happy to answer. Thanks so much for sticking with me through the 418 days of this kitchen remodel and for all of your encouragement when I was feeling down. I can’t tell you how much your support and comments have meant to me. I’ve also shared a post on all of the projects we did, including sources of all the products we used, if you want to check it out. 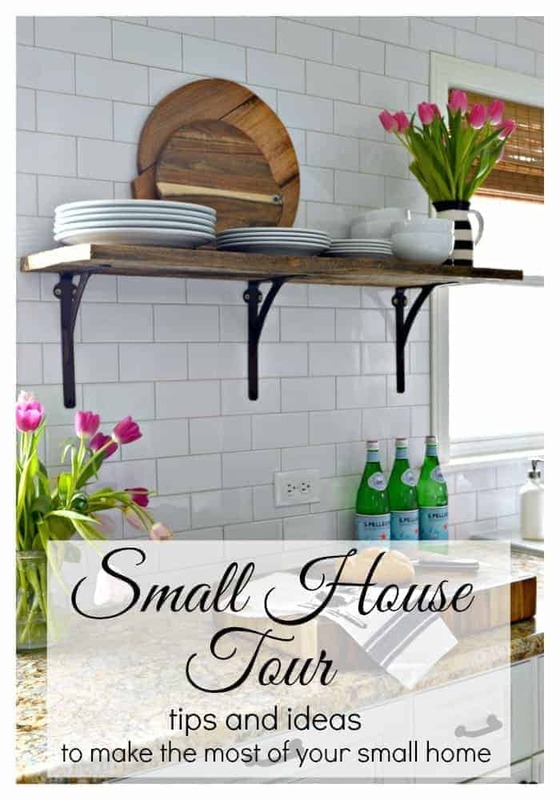 In case you missed it, I also shared a tour of my small home with tips on making the most of your small space. 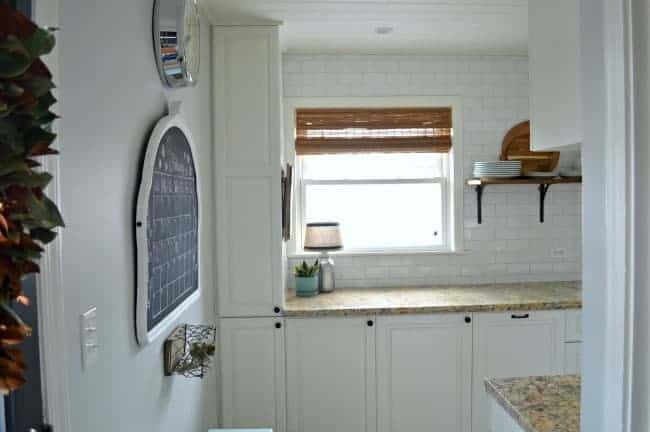 I love the subway tile and that you put it all the way up the wall behind the floating shelves. Classic and clean without being bland and dull. Thanks for sharing! Love your kitchen, looks amazing! What color are your drawer pulls and cabinet knobs? Hope that helps. Thanks for visiting. I absolutely LOVE what you did with your kitchen! you are amazing. Awww, thanks so much! I appreciate it! I just love how your kitchen turned out! I showed this post to my husband because I couldn’t get him to agree about running the subway tile up to the ceiling. Thanks to reading your post – he now agrees, and tiling starts over the weekend- YEAH!!!!! Now if only I could get him to plank the ceiling! That’s great Liz! I’m so glad that I was able to “convince” him to go for it with the tile. You will love it! Give him a little time, maybe he will come around with the plank ceiling. What a fabulous job…I love the simple lines and clean look. So nice. Where did you find the black brackets? 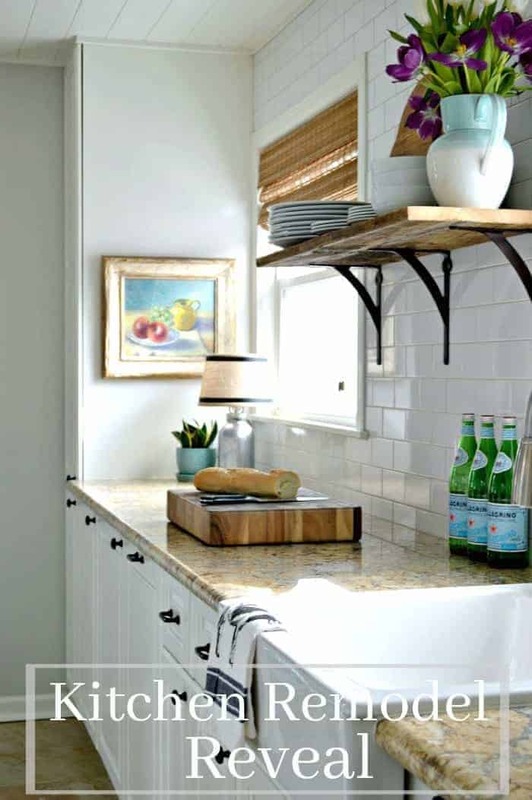 I would love to hang a similar shelf in our kitchen, love the brackets. I think you and your husband did an outstanding job on your new kitchen. I found your site by chance. So glad I did. You two deserve a nice vacation after this huge undertaking. Looking forward to any future makeover you decide to tackle. Love and best wishes. Hi Eva and welcome! So glad you found us (and our kitchen remodel reveal)! 😉 We had a blast doing the remodel, I just wish I had more time to enjoy it before we moved. At least I can look forward to another remodel in our new house…someday. Thanks so much for stopping in and for your sweet comment. 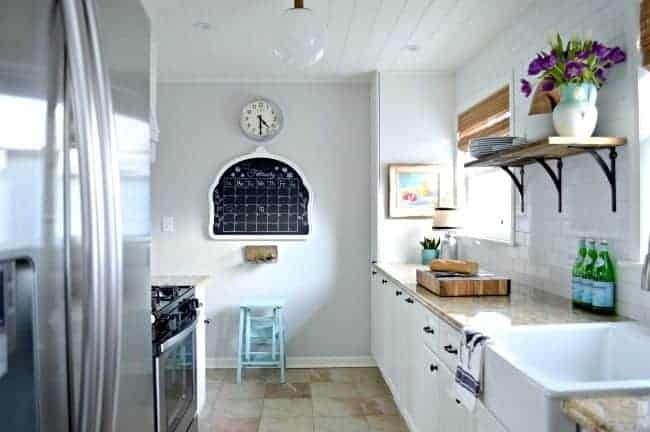 I would love to know name/brand paint on the wall in kitchen. Thanks. HI Kristi , DeeDee again maybe now I got that one out of ten through I can tell you how AMAZING YOU BOTH DID ON REMODELING YOUR KITCHEN!!❤️❤️? I just loved every little thing down to the shelf , chalk board you guys hit the nail on the head! Hmmm that should be a QOUTE for the day! Lol no it really is BEAUTIFUL! & im sure you inspired a lot of people ! Sorry I’m replying so late but accidentally came across the picture of your kitchen! I think I shared it on Facebook matter of fact, you guys keep up all that great work as it will leave impression’s on your heart as well and something you did together! Thanks for posting it as it helped me & gave me big inspirations! and would like to show you a picture of my project & see if you got any ideas for me? Does anyone else have problems with this site? as it always reloads on me than you loose everything you wrote & have to start over!! Big bummer . God Bless & keep up that great work that is obvious you have the touch!????????☕️☕️???? Hi DeeDee. Welcome and thanks so much for your very sweet comment. I truly appreciate your kind words about our kitchen remodel. I’m glad that we were able to inspire you. It was a real labor of love for us and we were thrilled with the results. I’m so sorry that you had so much trouble leaving a comment from your iPad. We’re looking into the issue and hope to get it straightened out. Please let me know if you have any more trouble. You can always email me at [email protected] with any questions or comments you may have. I’ll do my best to answer. Thanks again and I hope you have a wonderful weekend. I am in love with your kitchen (and your blog)! You gave me some great ideas for my own kitchen. Wow! The transformation is amazing. 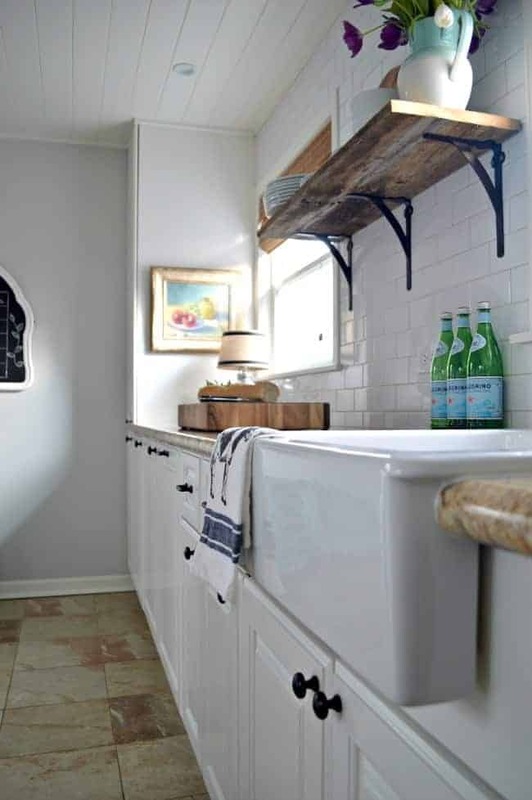 I love the open shelves and the subway tile and pretty much everything. It’s so much brighter and lighter. Well done! Awww, thanks so much Kati. I was really thrilled with the way our little kitchen turned out. I just wish I could have enjoyed it a little more before we sold the house and moved to NC. Your kitchen is so beautiful! I hop ours turns out half as nice. Love the sink & all your choices. Thanks for joining us at the Inspiration Spotlight party. Pinned and shared. Thanks so much, Theresa. It was a ton of work but we were thrilled with the way it all turned out. I appreciate you sharing and pinning my kitchen. Best of luck to you on your own remodel. Wow! I absolutely love it. Thanks so much, Meena, I appreciate it! This is beautiful! Kitchen goals! Thanks so much, Kendall. It sounds like you’ve been pretty busy in your kitchen too. It’s a lot of work, isn’t it? The only sad part is that we didn’t get to enjoy it for very long because we ended up moving, unexpectedly. Fortunately having the kitchen all done helped us to sell our house in less than a day. 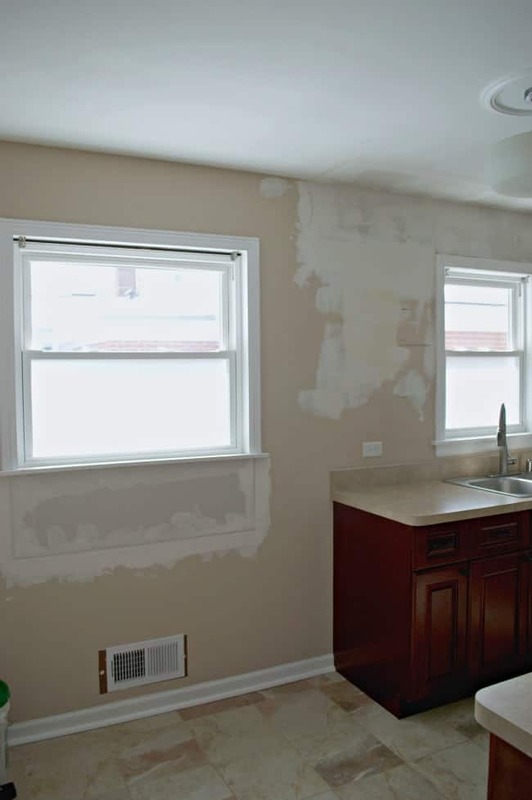 Best of luck with the rest of your kitchen redo. It looks awesome! 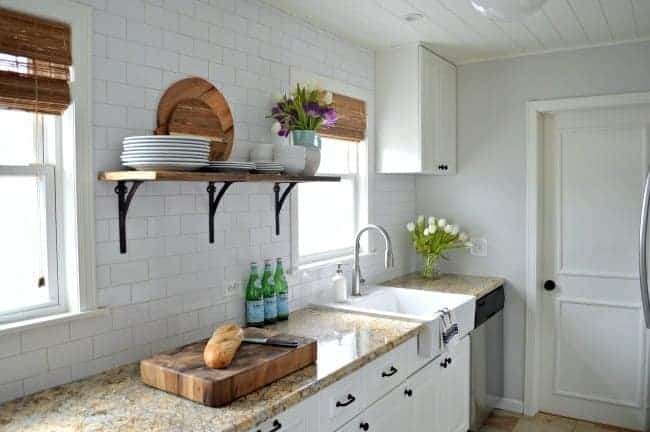 I love that you put in a shorter window to take the counter top all the way down. It looks huge and so much brighter! Thank you, Andrea. Actually, we just moved the window sill up. It’s the same window that was there but, by removing the long sill, we gained space that we used for more cabinets. 🙂 We loved how much bigger and brighter the space was when we were done. I’m curious how you moved the window sill up, and how it looks from outside the house. There’s a house I’d love to buy that I’d want to do just what you’ve done, but there’s a window in the way and I’m looking at my options. Thanks so much! Hi Becky. I did a post on exactly how we did it. There should be a link in the Kitchen Remodel Reveal post you read. There was no change to the outside of the house, all the work was inside. The house is brick so the hole where the old a/c was is boarded over and painted. Not beautiful by any means but not awful. Plus it was on the back of the house so it wasn’t really an eyesore. Hope that helps. Good luck with your house hunt. 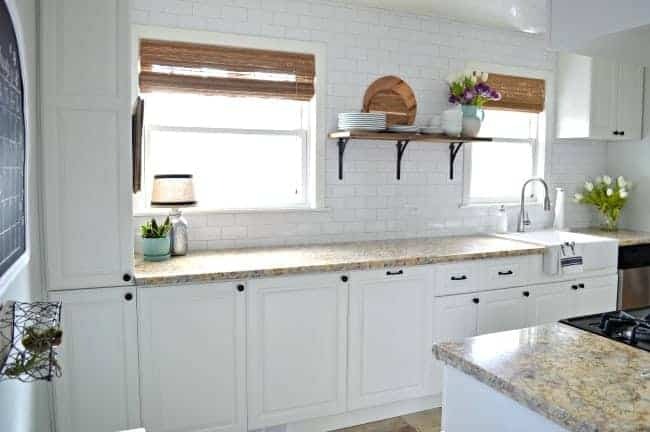 You both did an awesome job with your kitchen remodel and it looks gorgeous and yet so practical ! I always say, the size doesn’t matter, but how you create the space. Kristi, your kitchen is beautiful! I’m having the same issue with my kitchen floor. Actually everything in our house was beige beige beige. And I’m trying to make the transition over to grays and whites. But pulling up the ceramic tile throughout the entire house just isn’t in our budget. I love your counter top!! It’s exactly what I could use to tie in the tans and beige in the floors to the whites and grays in the cabinets and walls. Do you know the name of the granite? Again, your kitchen is beautiful and I’m so glad I stumbled upon a link on Pinterest!! Thanks so much, Cindy. I feel your pain with changing out the tile. We were trying to do this remodel on a budget and there was really nothing wrong with the floor so we left it. I was happy to find our granite at Floor & Decor. They only had a few pieces in the store but the one I chose had that fabulous streak of gray running through it. Unfortunately, I don’t know the name of it. They only stock a few pieces and that is all you have to choose from. The trade off was that it was reasonably priced. Sorry I couldn’t be of more help. If I can answer any more questions, don’t hesitate to contact me. Thanks for stopping in. I just LOVE it so much! Every detail is so perfect! Kristi this is FABULOUS! Wow. You did an amazing job. The after photos are simply gorgeous. 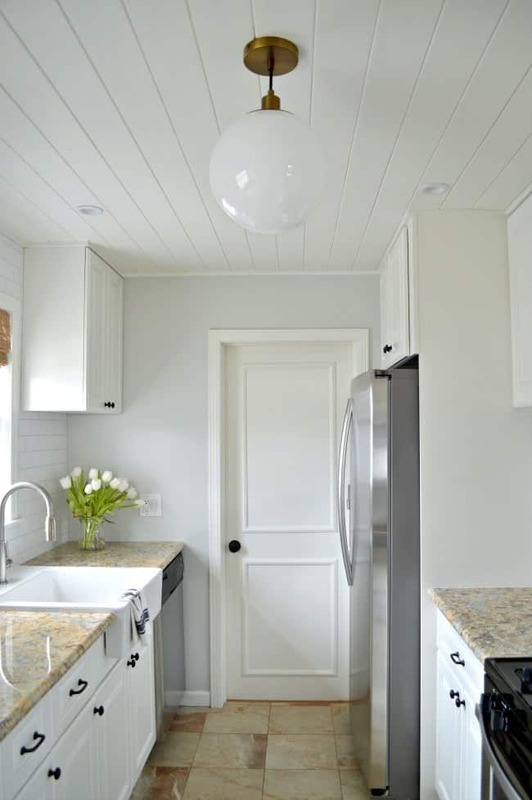 Love the white cupboards and that splash back just finishes it all off and not to mention that plank ceiling. Love it all! Thanks so much for linking up to The Creative Corner Link Up. Look forward to seeing what you link up tonight! So sweet, Maria, thank you. We love the way it all turned out. It is worth it in the end. 🙂 Thanks, Pamela, I appreciate your visit and your comment. It’s nothing short of awesome! I can see why it feels so much larger to you. I’d like to tell you what I like but I like everything; the windows, the extra counter space, the sink and all! Thanks for sharing your project with us at Merry Monday. I’m inspired! I’ll be sharing on my FB page. Awww, thanks so much Shirley for the sweet comment and for the share on FB. It was a ton of work but we’re so thrilled with the way it all turned out. Ahhhh, it’s absolutely gorgeous! SO much lighter and brighter! Thanks, Kristi. I never thought that painting the cabinets would make that big of a difference but I’m so glad it did. I appreciate you stopping in. Thanks, Mary Beth. We’re thrilled with the way it turned out. Beautiful! And look at all that counter space! Great job making this space more functional and aesthetically pretty! I’m hoping to start on a kitchen reno soon, this is so inspiring! Good job. Thanks so much! It was a lot more work than we thought but totally worth it in the end. Good luck with your reno. What a great makeover! So fresh and updated. Good for you. Sharing your beautiful kitchen on my facebook page!!! Thanks for joining THE SCOOP! Thanks so much, Yvonne. I appreciate the share. Gorgeous! Y’all did a great job. Thanks! We love how it turned out. Looks great! Made it so bright and cheerful now! Love the styling of your pictures as well! 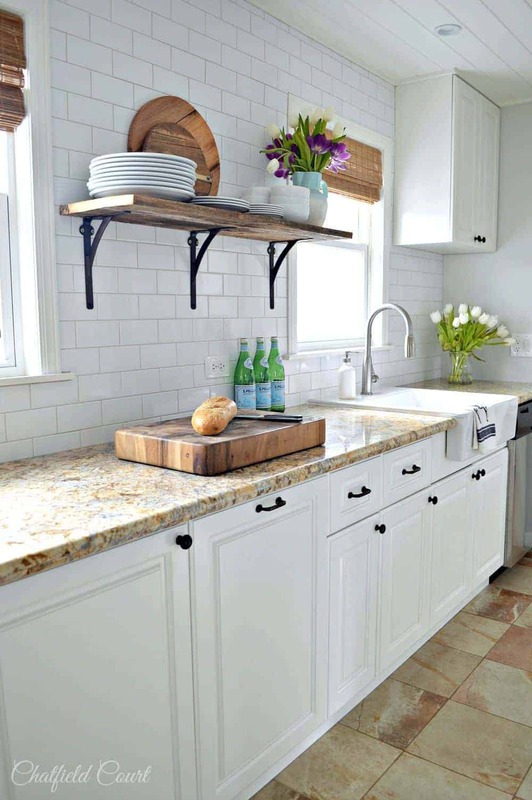 Great kitchen mak-over, I have similar reclaimed wood! I am in love with the tuscany inspired decor! Thanks so much, Maria. We loved how it all turned out. Everything looks great!! love it all…the ceilings is amazing! Pinning! Looks wonderful! 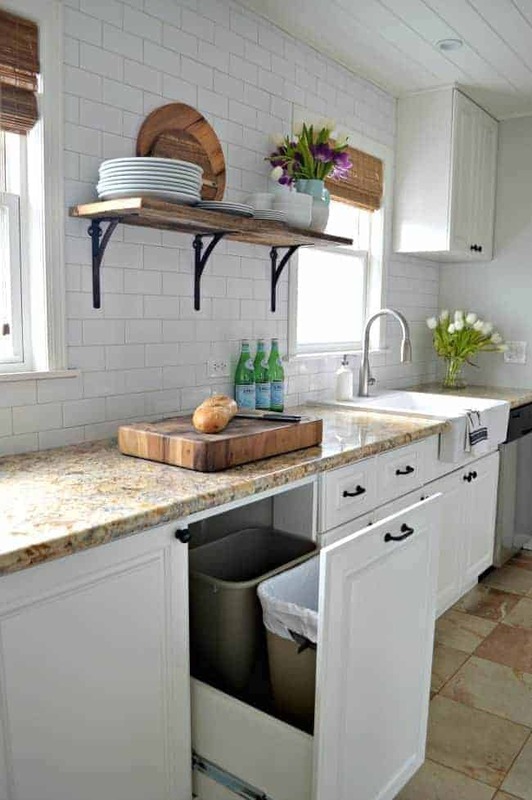 Love the ceiling, and the bin drawers, and the tile- well everything really! Awwww that so nice, Joyce. Thanks!! This is so pretty! I’m sure it was a ton of work, and I know how husband’s are when it comes to DIYing…begrudgingly helpful. I have one of those. But wow, the difference is amazing! So open and light and airy! I’m sure you’re enjoying it now, as you should be! May I ask the brand and model of your fridge? Our 1950’s kitchen doesn’t have much space for a fridge either! Hi Jules! I sent an email to you with the info on the fridge. Hi, I love the remodel! I was wondering where you did you get your round ceiling pendant? Thanks Tina. I think that we got the ceiling pendant from Home Depot. Hi. I love your new kitchen! Really beautiful choices – makes such a difference! I spotted a stool painted a pretty blue at the “empty” wall (under a chalkboard?). Can you share where you got the stool? It would be perfect for my kitchen! Hi Kristi ( I don’t get to say hello to someone with my name, same spelling, very often) ;)! Thanks so much for your sweet comment on our kitchen. We really love how it turned out. What a difference! Your kitchen looks amazing! wow, what a beautiful transformation. I just LOVE your kitchen. Thanks for sharing. Thanks so much Betty Ann, I appreciate your sweet comment. I loved your remodel. Did you paint the cabinets? Can you share more information on this. Apologize if I missed it . Hi, Asha. Thanks so much, we love our kitchen. We did paint the cabinets. If you care to read my post on some of the tips I shared, you can check it out here. 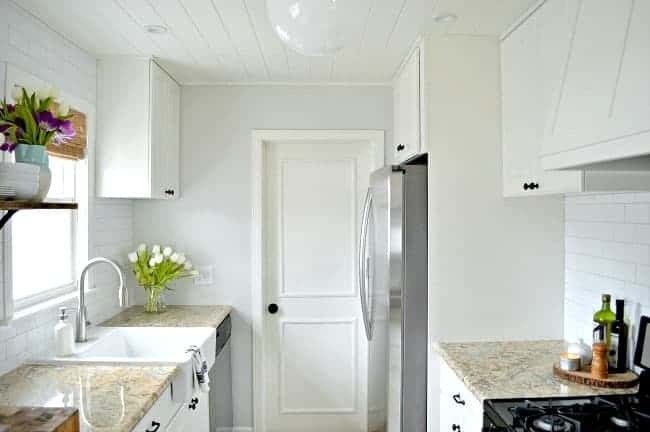 http://www.chatfieldcourt.com/tips-for-painting-kitchen-cabinets/ . I hope that helps. Love how the color you chose brighten you kitchen. Nice kitchen. Thanks for sharing. Beautiful job! 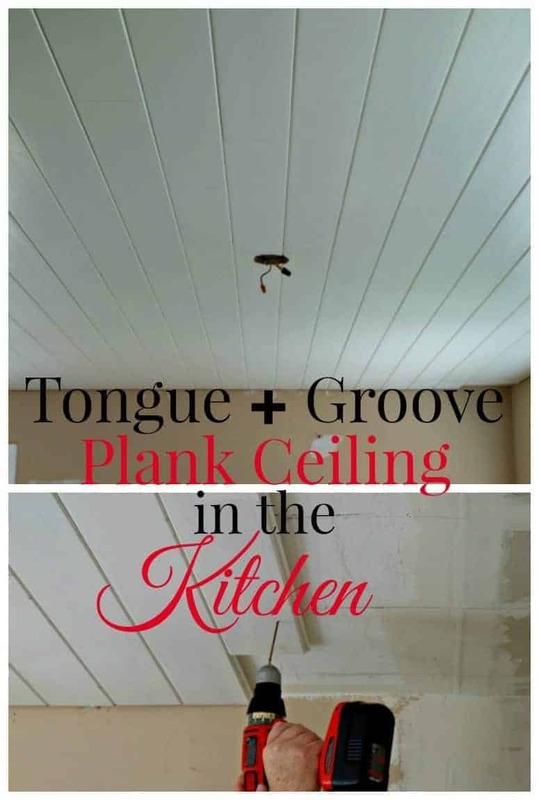 I admire the plank ceiling. Did you install that board by board? First time reader of your blog here:) Your kitchen blew my mind – because our first house had the sam kitchen layout! I always wondered how I could have remodeled it to make it more spacious and you did exactly that! Great job. I look forward to eading your blog more often. 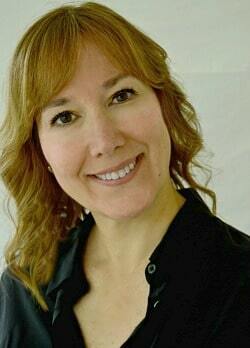 Hi, Karin and welcome! Thanks so much for stopping in and for your sweet comment. I so love your kitchen. My house was built in 1948 so I know that the kitchens are small so we have to use every inch we have. 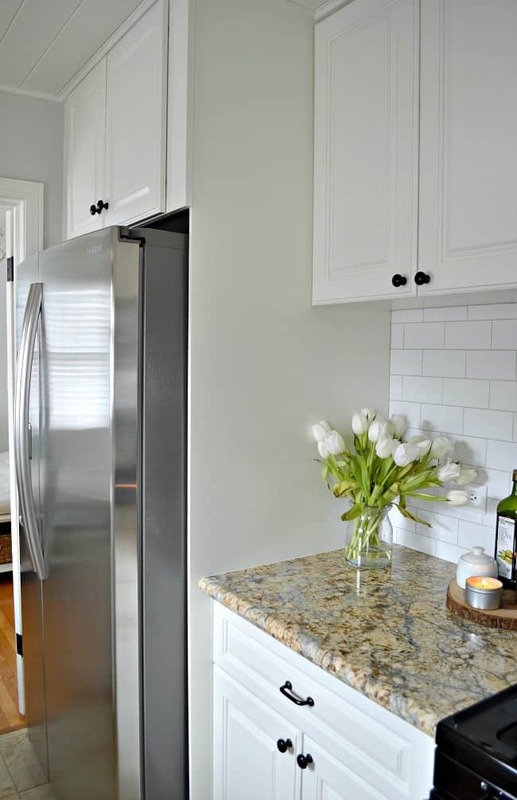 I am renovating my kitchen in the spring and I love the all white, it looks so bright & clean. You & your hubby done an amazing job..hats off to you both. I love all the detail but I especially like the chalkboard calender…did you make that yourself or buy it. All kitchens need one. Best of luck to you with your kitchen renovation. Oh man! Very nice remodel. I love light and airy. I am always trying to figure in my head how we can add more cabinet space to our small kitchen. I am 4′ 6″ and my husband is 6′ but we didn’t even put any upper cabinets except the one for the oven hood since I do most of the cooking. We have purged and purged and purged again. I am to a point where I just feel at some point I am going to need something of the things I have so no more purging. We think we have come up with a solution…we shall see. Sorry! I talk waaaay too much. Love your kitchen!! Hi, Jenn! Thanks for checking out our kitchen. I love when readers chat in their comments, that’s what we’re all about here so don’t apologize. We purged a ton of stuff too and we’re really careful about what we bring in, even when it comes to food. It’s funny how you have to consider that kind of stuff when you have limited space. I have room to spare right now but I know that it wouldn’t take much to fill it up. Would love to hear about your solution…when you’re ready to share of course. Oh Wow!! You guys did this yourselves?? 418 days? I totally applaud you !! It looks amazing! It makes it look so much bigger and brighter and much more fun to use…..Enjoy it you totally deserve it!! Thanks so much Nancy, I appreciate it! We are really enjoying the lighter and brighter space and, the fact that we can both be in there cooking at the same time is a huge plus. Thanks for stopping by to check it out. Kristin it turned out beautiful! You all did a wonderful job. Thanks so much Pamela, we are loving our new space. I’m a little late with this, but I love your kitchen! I bet you smile every time you walk in the kitchen! Been really busy at work, this is our busy season and I handle all the H-1B visas so I don’t usually want to be on the computer when I get home. Tried of staring at a computer all day long! I’m jealous, I can’t wait until my bathroom has every little thing done! Again, love, love your kitchen!!! Thanks MJ, it’s so great to hear from you. I’m so glad it’s done. I know that you’ll be done with yours soon and will be so happy with it.Thanks for stopping in and take care my friend. how wonderful! i think that extra long counter for prep space that ends in the storage is absolutely perfect. enjoy your new space! So sweet, thank you Deb! We couldn’t be happier with the way it all turned out. Extending the counter and bottom cabinets makes the kitchen look finished. The previous space was not really big enough for a table and chairs. Great new design and color. Thank you Judith. I’m so glad that we extended the counter and countertops. We have so much more storage and counter space and it really changed the look of the whole kitchen. Gorgeous kitchen! You did an amazing job! Thanks so much Jennifer, I appreciate you stopping in. It really looks wonderful! I am 14 months into my kitchen remodel and it feels like it will never be done! We are doing some open shelving as well. How are you liking yours? I love the extended cabinetry that you added, and the paneled ceiling. It all looks fantastic! Thanks Melanie, we love our new space! I know just how you feel but you will be so happy when it’s done…truly. As for the open shelves, I really love them. Being a neat freak who likes things clean and tidy, I was skeptical that I would like them but I do. We only have one and it holds the dishes that are used everyday, so they don’t have a chance to get dirty. Thank you for stopping and and I wish you luck with the rest of your remodel. Love it!!! Simple and clean yet stylish and welcoming. I notice you do not have a microwave. I got rid of mine about 5 years ago. I do not miss it at all. If you want to do another kitchen you can do mine. 😉 I have a spare room and the weather is nice here in Florida. I am also less than a mile from the beach. Great place to relax. Enjoy your new kitchen and have a great week. I appreciate you sticking by me through this long process and offering endless encouragement and support when I was feeling discouraged or stressed. It has truly meant so much to me. Your new kitchen is gorgeous. You and your husband should be so proud of a job well done. Congratulations. Thanks Debbie, I appreciate it. We are loving and enjoying our new kitchen. Your kitchen is bright and beautiful! Visiting from Cozy Little House. Thanks so much for stopping over Vickie, and for your kind comment. I love what you did with your space! I too have a small kitchen, so I love your ideas! You have to come this this up at Welcome Home Wednesdays. Party opens at 7a CST! Thanks Erin! It was a challenge getting all of our space issues solved, but we are thrilled with the results. I appreciate the invite and will definitely check out your party. It turned out just gorgeous Kristi – LOVE the backsplash tiles and how you made the counter extend to the end of the wall – it’s a beauty now ! Thanks so much Nancy, I truly appreciate it. You are so right, taking down that cabinet made a huge difference. Unfortunately we don’t have a great view but the light in there is awesome. I love how light and bright the room is now. I did have to do custom shades in these windows. They are both different and odd sizes so I had to go custom. I love the texture they add to the room without blocking any of that precious sunlight. Hope you have a great week my friend. Like everyone else – this is truly a WOW! Congratulations and now’s the time to just relax, take full credit and enjoy. This was a huge job and you both deserve all the Kudos given. Thanks so much Tara. I was nervous about removing that cabinet and losing storage but it made a huge difference. I appreciate you stopping by. Not a lot of homeowners would have shortened the window. Great decision. Very nice finishes, yay you guys! It’s beautiful. Congratulations! It looks so clean and fresh. What a pleasure it must be to work there. Thanks Brenda! We love our new space and it is a pleasure work in there. So glad you stopped in to see the reveal. Kristi, what a gorgeous space you have created! I love LOVE the planked ceiling, the range hood, the open shelving… Well, you gave yourself a brand new kitchen, it’s beautiful! Thanks Cristina! Looking at beautiful kitchens remodels, like the one you did, served as great inspiration to us. We are loving our new space and I feel like I’m walking into a new house every time I go in there. Congratulations. It is really beautiful. Thank you Phyllis, I appreciate you coming along for the ride. 😉 Hope you both are well. Hi Maureen! Thanks so much for stopping in and for your lovely comment. Actually I don’t have any kind of pantry or closet in the kitchen so my kettle and toaster are in my cabinets, ready to grab. I don’t like having stuff out on my counters, so I found a spot where they are out of sight but easy to reach (I have a back injury so I understand your issue). I don’t have a lot of gadgets or dishes or pots and pans, just necessities. In our case it seems like a waste of precious space when something sits in a cabinet and never gets used. As for our washer and dryer, they are in our basement and we do not have a microwave. I hope some of that helps. If you have any other questions, feel free to ask. Oh wow, you must be so pleased with the result! It looks so lovely! I’ll be changing our kitchen later this year (to Shaker style), and I was at IKEA today and saw a sink very similar to yours which I’m keen on. 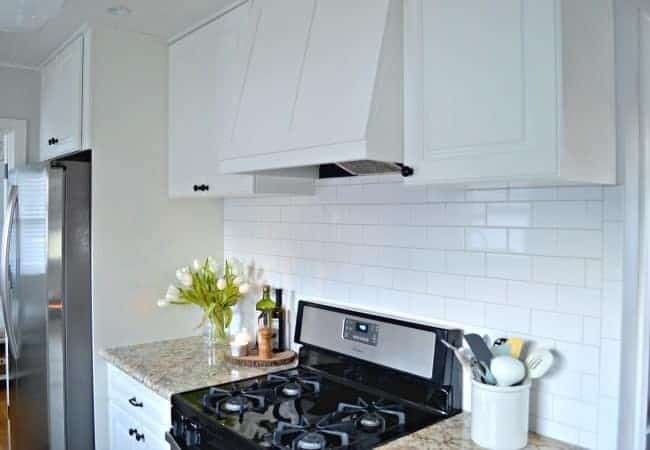 As we aren’t replacing cabinets, and I imagine you didn’t either, I was wondering if it was difficult cutting down your cabinet front to allow for the apron-front-bit of the sink? (Technical terms!). I’m also looking forward to knowing what colour paint you used on the walls. Congratulations on a great job! Hi Elisabeth, thanks for visiting from Australia! We did not replace cabinets but the sink was a bit tricky. There was a limited amount of space for the sink and we were lucky that it fit. The original apron was removed and we just cut it to fit around the sink and reinstalled it. Not a difficult project at all. As for the walls, I used Benjamin Moore Gray Owl, at 50% strength. It’s the same color that I used in my living room and I love it. Hope all that helps. If you have any other questions, don’t hesitate to ask. Best of luck on your kitchen redo. Cheers! Your kitchen looks great! What color paint for your cabinets? Wow, Kristi it looks so fabulous!!!! 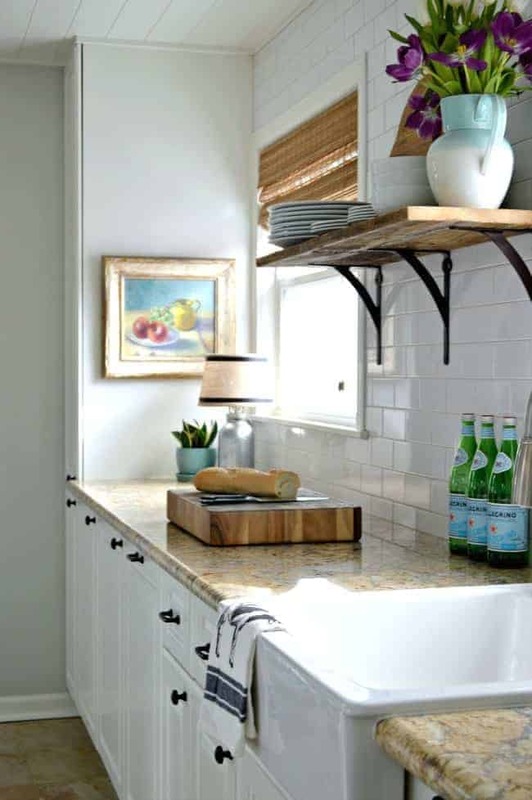 I love the subway tile going all the way up and the open shelving. The space looks larger and brighter. Y’all can pat yourselves on the back for a fabulous job! Wow, Kristi ~ your kitchen is so gorgeous, I love everything about it and I’m so impressed at all the work you and hubs did. It’s really beautiful!! Thanks so much JoAnne, that’s so sweet of you. It was a ton of work but we love how it turned out.